done to bring the absolute best out of each vehicle. "For a defect free finish"
2013 Range Rover - 2 Stages Paint Correction where used. INTRO: Whether your car is a vintage, standard, or an exotic car, the overall condition depends on the way you have looked after it. Regular fast car washes damage paint and can make a brand new car look older than a 15 year old car that has been maintained and cared for correctly by professionals. Paint is affected by a large number of elements such as extreme temperature variation, UV rays, acid rain, sap, tar, over-spray and more commonly scratches & swirls caused by automatic car washes or by incorrect hand washing techniques, tools & certain cleaning chemicals. START: We thoroughly wash & decontaminate the surface. We clay bar the paint, remove all oils and waxes currently on the surface followed by a thorough compressed air and microfiber drying process. We then tape all trim and rubber areas which takes 2 - 3 hours and then we begin the paint correcting process. PROCESS: It is possible to make the paint look like new again. 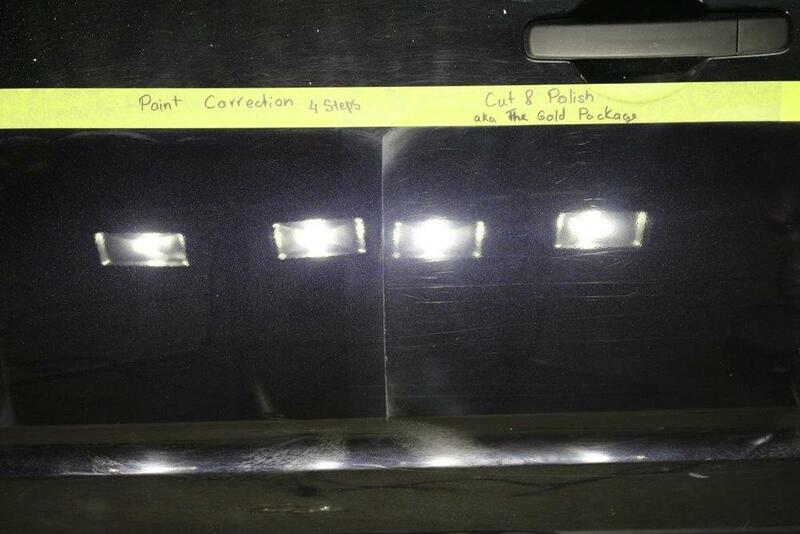 We have 4 available steps we can use to correct your paint. Depending on your vehicle's condition, we may use them all or we may use just one. Our Paint Correction works by leveling down the surface until the scratches have disappeared by 90 - 100% . We do not use fillers to hide or mask the scratch - This is a genuine repaired surface. AFTERMATH: Once the paint is like new, we apply some protection to ensure the paint will stay in this highly detailed condition. Either paint protection films, ceramic coatings or waxes are applied. "The closest we get to perfection - a true Supercar finish !" Intro: About 20 years ago, orange peel wasn't the norm. This has slowly changed and now manufacturers such as BMW and Mercedes who are renowned for their luxury and supreme engineering sell their cars without properly removing the orange peel. Removing orange peel can only be done once the paint is fully cured. Tens of hours can be spent on removal which of course affects the bottom line. This process is still a must for the high end super-cars such as Lamborghini and Ferrari. Process: Before starting the work, we measure the paint thickness to ensure the paint is thick enough to move forward with the sanding. Depending on your vehicle's condition and paint type, harder (eg. European cars) or softer (Asian cars) we can use up to 5 different sanding grits. We always start with the least aggressive and move up grades until the right sanding grit is found to suit the specific vehicle. Once the paint is flat, with few or no peaks in the paint, we move on to Paint Correcting. A minimum of 3 steps will be used to make the paint look better than it ever did. The best thing is that once the orange peel is removed, it will never come back again leaving you to enjoy the clear, mirror like finish, found only in high end, exotic cars. Headlight deterioration is not only a cosmetic issue, but also a safety one. That is why the lights are checked when the Warrant Of Fitness is done. Overtime headlights slowly start degrading and show signs of oxidation, scratches, fading & yellowing. All these affect the headlight clarity and their overall durability. If they are bright and clear, ensure to have them protected. We may be able to help you with this or help restore them to their former glory. The method used is similar to the orange peel removal process but on a much smaller scale. We may use up to 3 different sanding grits to remove imperfections and level down the area until is smooth. Following this we then use 3 polishing steps to bring back the transparent clarity. Once the clarity is back, some sort of protection is essential to ensure they will stay clear for a long time. We recommend the detailed touch-up for valuable vehicles. This is a 6 step process. For daily drivers, a general 2 step touch up will be enough. Any touch up is better than no touch-up. Leaving the surface exposed will cause the metal to rust. The layers of paint underneath the top coat are often different in colour, which makes the stone chips stand out more. Our detailed touch-up process is much different than our standard touch-up. The area to be touched up is thoroughly cleaned to remove any oils. Then the edge of the chip is carefully sanded until it is smooth. The touch up paint is then safely dabbed into the chip and left to dry. Once dry, the freshly painted area will receive a very light sand to remove the "crown" and level the paint down smoothly. Once that is done, we polish the areas to a defect free high gloss, leaving you to wonder ... where were the stone chips? Are you prepared to have your vehicle look better than brand new? 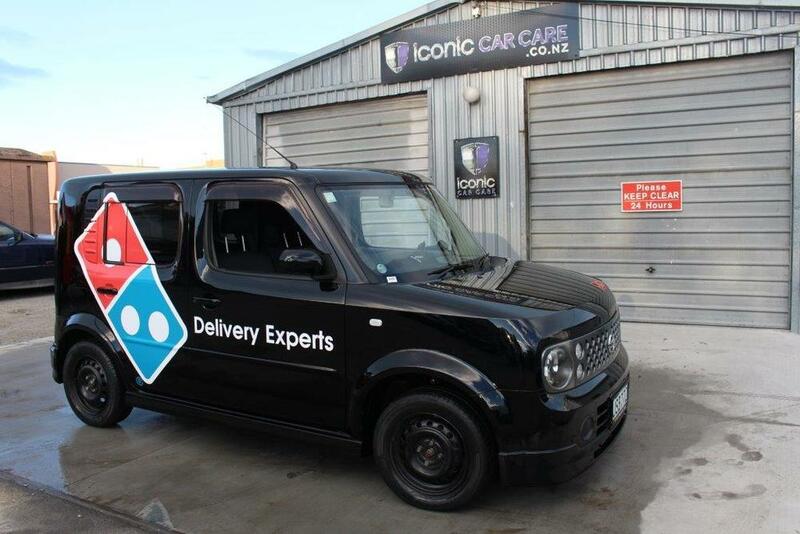 ICONIC - YOUR PARTNER IN CAR CARE!